Habit: Annual 10--45 cm, glandular-puberulent, stiff-hairy. Leaf: 10--50 mm; lobes 5--9, +- thread-like. Inflorescence: 2--20 cm, 2--4 cm wide; bracts 10--25 mm, white to purple-red, lobes 5--9 (lowest pair often again 2--4-lobed), +- linear, tips wider. Flower: calyx 10--22 mm, divided 1/2 abaxially, 2/3 adaxially, 1/3 on sides, colored like bracts; corolla 12--30 mm, beak 6--7 mm, densely shaggy-hairy, tip hooked, lower lip 4--6 mm, pouches 3--8 mm wide, 3--4 mm deep; filaments puberulent; stigma +- included. Fruit: 10--15 mm. Seed: 1--2 mm; coat deeply netted, loose-fitting. Note: Highly variable; hybridizes with Castilleja attenuata, Castilleja densiflora, Castilleja lineariloba. 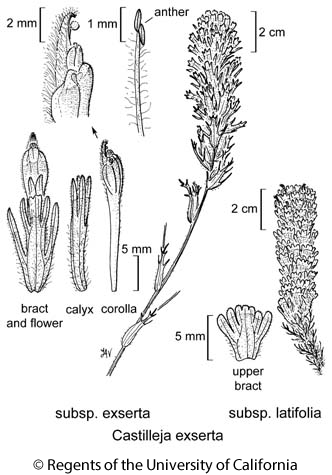 Inflorescence: distal bracts generally < 5 mm wide, lobes > 2 mm, tipped white, pale yellow, or rose to +- purple. Flower: corolla colored like bracts. Chromosomes: 2n=24. Citation for this treatment: Margriet Wetherwax, T.I. Chuang & Lawrence R. Heckard 2012, Castilleja exserta subsp. exserta, in Jepson Flora Project (eds.) Jepson eFlora, http://ucjeps.berkeley.edu/eflora/eflora_display.php?tid=49744, accessed on April 26, 2019. NW, SNF, GV, CW, SW, w DMoj; Markers link to CCH specimen records. Yellow markers indicate records that may provide evidence for eFlora range revision or may have georeferencing or identification issues. Purple markers indicate specimens collected from a garden, greenhouse, or other non-wild location.